Canadian photographer Stan Douglas is showing just two new works at Victoria Miro, but they’re huge: giant aerial shots that scream London – red buses, sprawling LCC estates, sooty treetops and 130-quid-fines-for-entering box junctions – the city we all know and inhabit, day in, day out. Which is part of Douglas’s point. Because it’s not that city: this is London mid-riot. There are knots of people in the streets, lines of police, small fires burning. 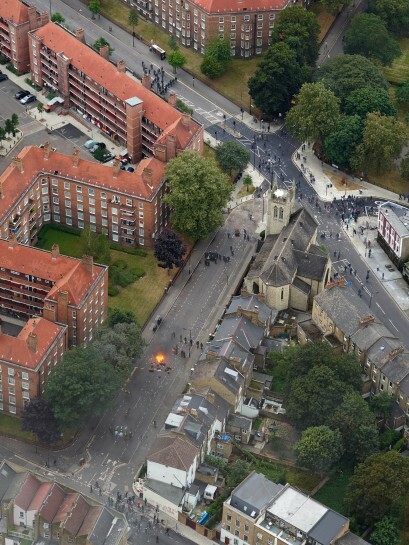 Douglas chose two flashpoints from the summer 2011 riots, Mare Street and the Pembury Estate, and recreated them. He re-shot the locations from a helicopter, then mapped contemporary source material on to the images: news video and still shots, and evidence off the internet. The results are like those museum dioramas of battlefields. You could never have got such a perfect overview at the time. And I think the term is crucial. Douglas’s elegant – even beautiful – pin-sharp pictorial renderings don’t just operate on a visual plane. The ‘overview’ is political and historical as well.